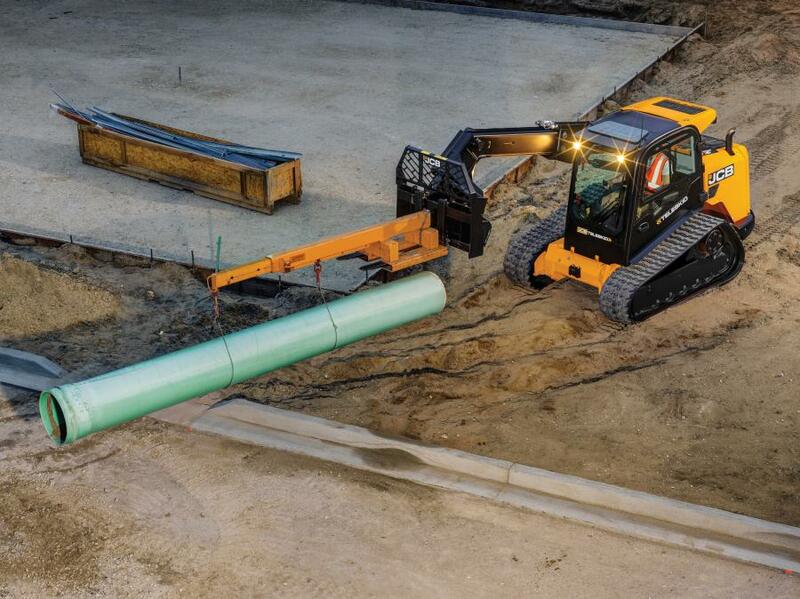 Compact and mini-excavators give operators surprising power and effortless hydraulics for their size. The ability to tackle tough and variable jobsite applications defines a successful and reliable piece of construction equipment. That is particularly true of machines that move earth and handle debris and materials. In today's economy, as contractors decide what type of product to buy or lease, cost cannot be their only consideration. Rather, they also need to understand the differences between large, midsize, compact and mini equipment to help them choose what will work best in their operation, factoring in how much weight and capacity they need from each machine. Even if huge amounts of dirt and materials need to be moved, a knowledgeable contractor usually accompanies his heaviest machines with more maneuverable mini-excavators, compact loaders and mini-skid steers to add a bit more nuance in the work zone. Your first question, then, may be what defines a mini or compact piece of equipment and distinguishes it from its larger brother? A compact or mini-excavator, for example, is a tracked or wheeled vehicle generally considered to be less than 13,000 lbs., and it can use various tools to do many more tasks than simple excavation. Skid steers are small by nature, but the minis can get into narrow spaces much more easily than any other loader. They also can do a huge variety of tasks because they can utilize a wide range of attachments and tools. Compact wheel loaders typically have a horsepower of 100 or less. They enjoy broad appeal because of their diminutive size, coupled with ample lift capacity and maneuverability. In addition, their rock-solid durability and proficiency with attachments have kept their popularity high. "‘Mini' or ‘compact' means something entirely different based on the category or style of equipment, and it's often relative to the size classes of each product category," explained Ed Brenton, brand marketing manager for Case Construction Equipment. "For instance, a compact wheel loader is not as small or compact as a mini-excavator, but relative to their full-sized/conventional counterparts, they are smaller and capable of being more agile and working in tighter conditions." The great success of compact and mini equipment has created a competitive field in the marketplace. Case is just one of several such manufacturers, along with Caterpillar, Bobcat, JCB, Vermeer, John Deere, Hyundai, Kubota and others. An obvious selling point for any compact or mini piece of equipment is its maneuverability and ability to work around other, often much larger, machines. But adaptability also is a trait claimed by these mighty mites, led by the dexterity of mini-skid steers. Contractors of all sizes love mini-skid steers. And why not? They offer builders so much flexibility on both large and small job sites and do so with efficiency and reliability. Their legendary utility is boosted when the machine is equipped with an array of different tools and attachments — effectively making them Swiss army knives on wheels (or tracks). North Dakota-based Bobcat Company invented the world's first skid steer loader and, along with its customers, recently has celebrated a 50-year history of quality, performance and reliability. Today, it produces the world's best-selling mini-skid steer line. When paired with a genuine Bobcat attachment, each of the maker's 12 skid steer models is a ubiquitous presence on North American job sites. Among the most popular attachments available in Bobcat's line of 75 different tools for its compacts are buckets, augers, clamps, concrete mixers, breakers, grapples, pallet forks, sweepers, trenchers, grader, flail mowers, plate compactors and snowblowers. From the maker's S70 model, its smallest with a rated operating capacity of 700 lbs., up to the largest, the S850 with a ROC of 3,950 lbs., all Bobcat skid steers have been perfected over the decades to be workhorses noted for their ability to maneuver into tight spaces. In addition, they are highly productive and built to last. Updates in the technologies that allow operators to power mini-skid steers more smoothly and easier are one of the primary goals of the engineers and designers at each manufacturer, and Bobcat has certainly been at the forefront of those efforts. "From a machine-control perspective, joysticks are offered on our models which provide fingertip controls enabling an operator to effortlessly direct multiple functions without letting go of the sticks," said Jason Boerger, marketing manager at Bobcat. "Some features may include speed management so that the operator can adjust travel speed independently from the engine speed for greater attachment control, or steering drift compensation which keeps the mini on a straight path as an operator side-shifts certain types of attachments." JCB boasts a diverse skid steer lineup of 13 models, led by the Teleskid, which was launched almost two years ago. It is the world's only skid steer and compact track loader with a telescopic boom, allowing a forward reach of 8 ft. — 60 percent farther than any other on the market — and a lift height of more than 13 ft., which is 8 percent higher than competing skid steers, according to the company. Additionally, it is the only skid steer or compact track loader that can dig below grade, to a depth of 3 ft., meaning an operator can keep the machine safe on level ground, extend the boom and lower the bucket to dig. The Teleskid is available on the JCB 3TS-8W wheeled and 3TS-8T track models. 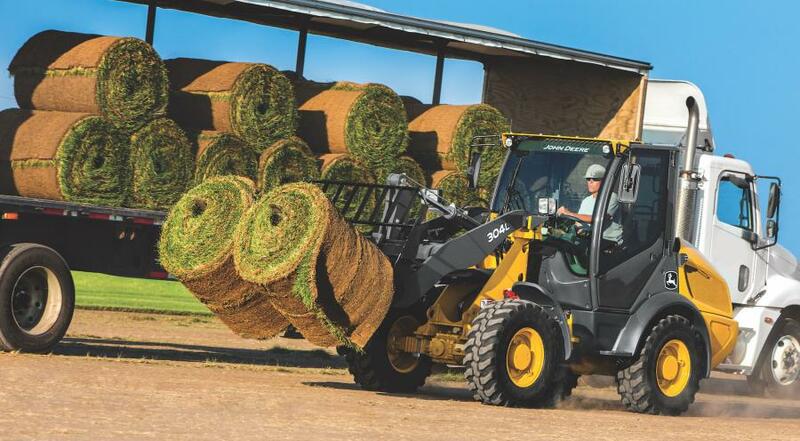 "It is truly a versatile machine, and customers all over are constantly finding different uses for it," added Ashby Graham, general manager of product at Savannah, Ga.-based JCB. "With its superior lift height, you can dump over trucks without having to build ramps or remove sideboards. It has an eight-foot forward reach, so you can load and unload one side of a flatbed trailer." Kevin Coleman, product application specialist of Caterpillar mini-skid steers, said Cat customers list visibility and comfort as being two primary concerns when choosing a mini-skid steer. "An operator's ‘office' should be somewhere he wants to be," Coleman said. "It should also have a comfortable ‘chair,' an ergonomic ‘desk' layout and afford a good ‘view'. "In other words, he wants a seat paired with low-effort joystick controls that provide him maximum control, but minimum fatigue, especially when operating for long periods of time," he continued. "As a result, all Cat skid steers offer a high-back, heated, air-ride seat with independently adjustable seat-mounted joystick controls so that they move with the operator and allow precise and easy control, even when traversing rough terrain." An ergonomic cab design, Coleman explained, needs to possess an intuitive layout in which everything is effortlessly located and accessible, such as switches, cell-charging locations, A/C controls and heads-up informational display panels. Using the rearview camera in conjunction with the standard rear-view mirror, Cat's skid steers deliver the operator excellent rear visibility to eliminate him having to crane his neck to see when reversing the machine. "The view on a skid steer can be defined as allowing the operator to easily see the critical areas of his work, such as the bucket cutting edge, the sides of his bucket, the front/rear/sides of his tires [or tracks], the rear machine corners and the area behind the machine," he noted. Iowa-based Vermeer manufactures four mini-skid steers that are highly productive and boast the breakout force and lift capacity more commonly associated with larger skid loaders. "All Vermeer mini-skid steers come with a ride-on operator platform, accompanied with an operator presence system and a single, pilot-operated joystick for ground-drive control," said Brett Newendorp, Vermeer's landscape marketing manager. "These features, along with the layout of our control station and the longevity of our track and undercarriage system have made Vermeer mini-skid steers some of the most popular in the marketplace today." He added that Vermeer's most recent models, including the CTX100 and the S925TX, have been engineered with several performance enhancements. For example, on the S925TX, Newendorp cited improvements to the hydraulic efficiencies within the system of pumps, valves, and motors, which give the operator a smoother feel and deliver a more tractive effort when digging into a pile of material. 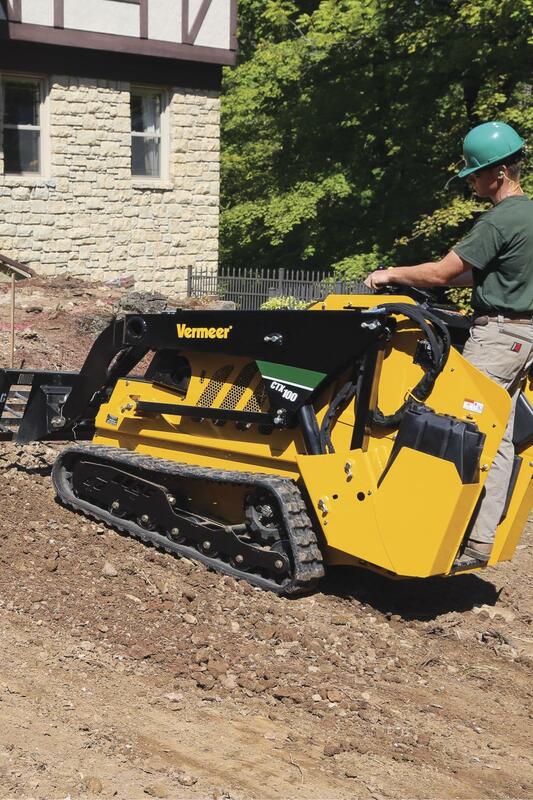 The Vermeer S925TX sports a tip capacity of 2,643 lbs., a rated operating capacity of 925 lbs. and a maximum hinge pin height reach of 84.5 in. The mini-skid steer's radial lift path is well-suited to lifting and dumping heavy loads, Newendorp explained. A dual auxiliary system allows the operator to switch between high flow for ground-engaging attachments and low flow for maximum control. It also has a universal mounting plate that fits a broad range of Vermeer-approved attachments. The company's engineers keep a close eye on the cost of operations of its mini-skid steers. Newendorp noted that the manufacturer has recently updated its tracks, rollers, idlers, and sprockets to increase the time between having to replace these wear components. Compact and mini-excavators available today give operators surprising power and effortless hydraulics, along with an excellence at combined functions — attractive features that contractors crave. With Kubota's world-renowned diesel engines at their core, the company has garnered a reputation as a global leader in compact construction equipment. The manufacturer's top-selling excavator line offers both a minimum tail-swing excavator, referred to as the "U" Series, and a conventional tail-swing excavator, known as the "K" Series, noted Jeff Jacobsmeyer, Kubota's product manager of excavators and wheel loaders, adding that each series is made up of four different models. "Our U Series offers the advantage of the counterweight being very close to the width of the tracks when turned to the side for tighter working applications," he said. "The conventional tail-swing excavators have more counterweight overhang when turned to the side, which provides an advantage for side-load stability and performance." An exciting new addition to the Kubota line for 2018, Jacobsmeyer said, is the KX033-4 model with extendable dipper arm. Ideal for hard-to-reach areas, the KX033-4's arm can quickly be extended up to 31 in., boosting its productivity and efficiency. Its capabilities include a digging depth of 12-ft. 2-in. and a digging reach of 18-ft. 3-in. 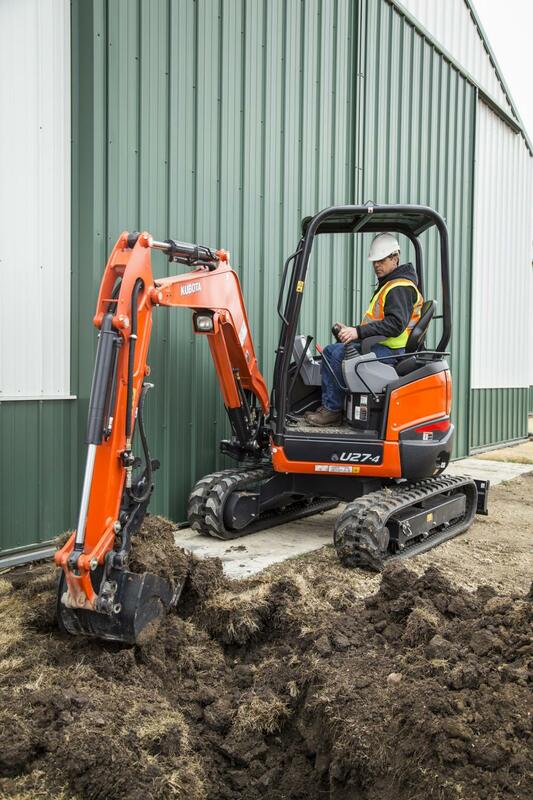 "Kubota's minis, like all of its excavators, are equipped with a backfill blade for easy clean up," he added. "This blade can be lowered during hard digging conditions to add more stability to the machine if needed." The buckets and tools on the six models offered by John Deere are all equipped with auxiliary hydraulics plumbed to the end of the boom, according to Jonny Spendlove, John Deere product marketing manager. 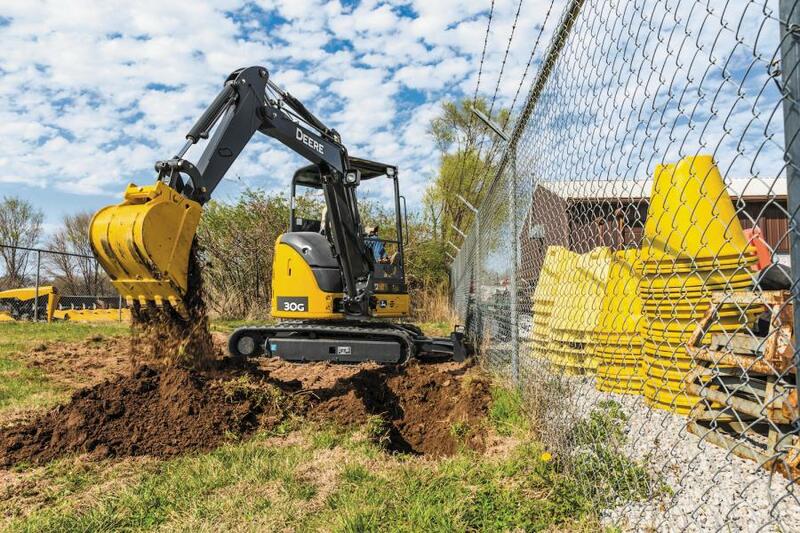 "Compact excavators are extremely versatile and can be paired with a variety of bucket attachments including augers, plate compactors, couplers, and thumbs," Spendlove said. "Together with the ease of transportation, their versatility makes them perfect for applications ranging from landscaping to trenching." John Deere's model 17G features an adjustable undercarriage and blade width to allow the machine to fit through a 38.6-in. opening when retracted and expand to 50 in. for maximum operational stability, he said. The new 30G offers more power than other options at the smaller end of the compact equipment class. It, along with the 35G, 50G, and 60G machine features two operating mechanisms: Power mode delivers a balance of power, speed, and fuel economy for normal operation, while Economy mode limits top speed and saves fuel. Spendlove said that John Deere also has just added a canopy option to its 60G compact excavator, meaning that it is now standard or an option on all models in the line. John Deere was one of the first manufacturers to introduce a zero-tail-swing (ZTS) concept in North America. The upper structure of the ZTS models (35G and 50G) rotates within the width of the tracks, significantly reducing the chance that the excavator will damage surrounding property while rotating. Spendlove said that both ZTS models and reduced-tail-swing models are highly versatile and operate well in confined spaces. Case has seven mini-excavators from which to choose, with six of them introduced in 2017. Among the newest are the CX57C and CX60C, which give operators greater power and performance than previous models, as well as best-in-class horsepower. "With our mini-excavators, we've focused on developing advancements such as an offset boom that allows contractors to get right up alongside the structure they are working adjacent to, while giving the operator excellent visibility down into the trench," Ed Brenton explained. "We also made bidirectional hydraulics standard on our mini-excavators as more contractors see the equipment they buy as a multipurpose tool carrier vs. a one-trick pony. This allows them to use any number of one- and two-way attachments that are now available." Additionally, the front dozer blade that comes standard on all Case C Series mini-excavators has proven to be a great utility tool. It acts as a natural stabilizer while digging, Brenton said, but it also is good at backfilling the trenches it digs and creating a rough grade in those applications. 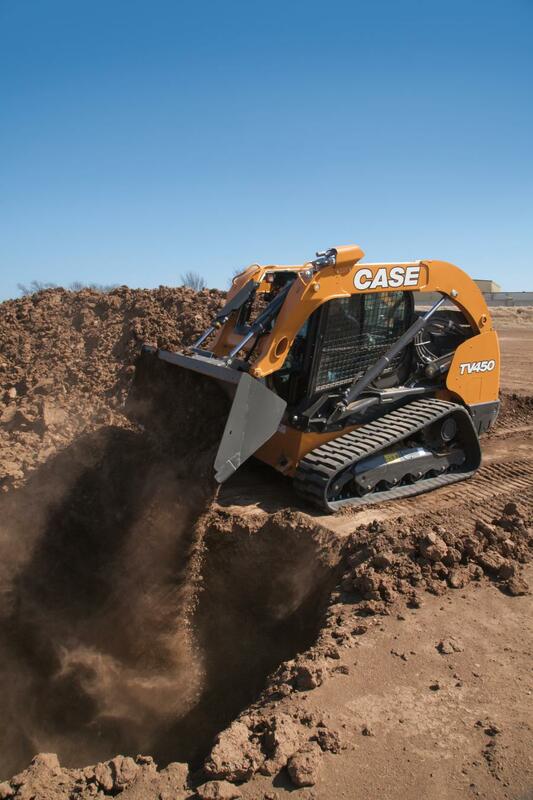 Case, too, has mini-excavators in conventional, minimum-swing and zero-tail-swing configurations to give the contractor the combination of size, access and power that works best for them. "Each provide greater access than larger, more conventional machines — but this really allows the prospective buyer to dial the machine in to their application," Brenton reported. 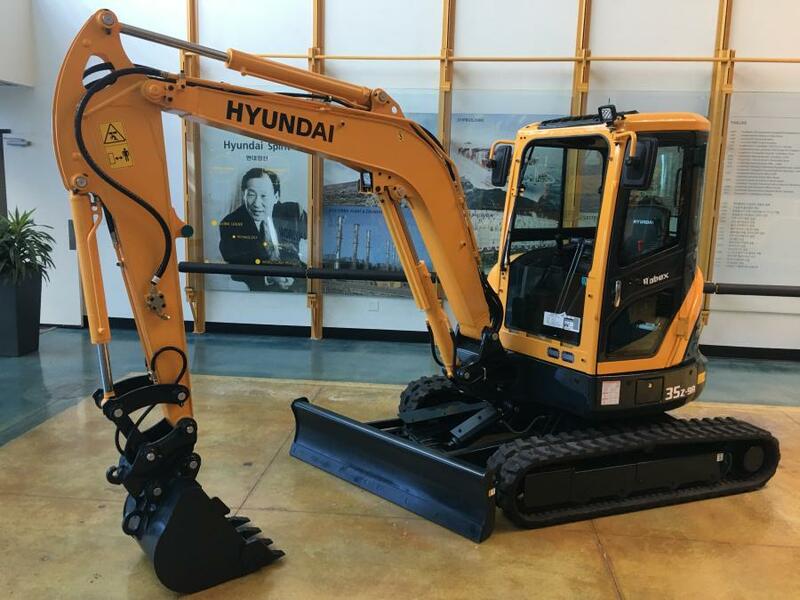 Currently, Hyundai makes seven compact excavators, including the 3½-ton class R35Z-9A model that has been boosted with a variety of improvements. The vehicle features a zero-tail-swing design for optimum maneuverability in confined work spaces. Just a few of those upgrades, now standard on Hyundai's R35Z-9A, include a diverter valve for easy switching between a thumb or attachment, enhanced bucket design with lifting-eye and two-piece tooth design for easy replacement, improvements to the dozer blade and a durable centered boom LED work light for improved jobsite illumination. A new optional feature is the four-way angle dozer blade. 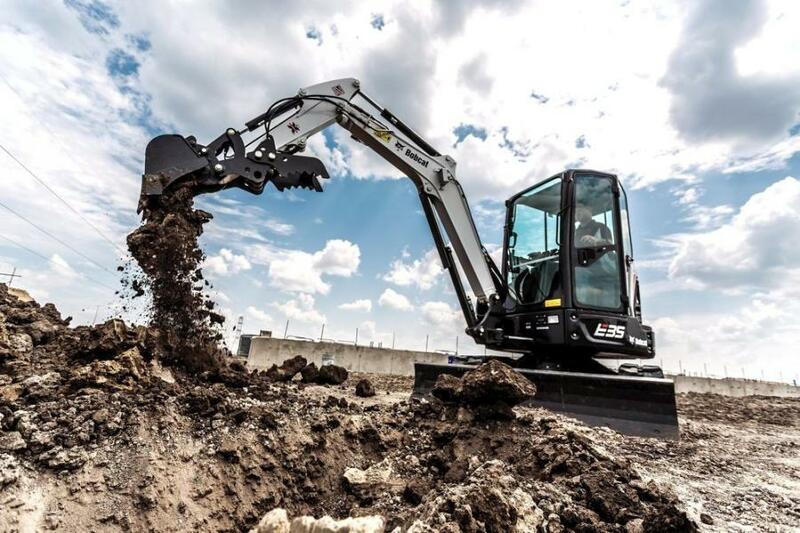 "Innovative, precision-designed hydraulic system technologies make the Hyundai 9A series compact excavators fast, smooth and easy to control," explained Corey Rogers, marketing manager of Hyundai Construction Equipment Americas, located in Norcross, Ga. The use of telematics to monitor equipment in the field continues to evolve and has proven to be an effective cost-saving measure, as well. Three of Hyundai's compact excavators, the R55-9A, the R60CR-9A and the R80CR-9A, are equipped with the manufacturer's exclusive HiMATE remote management system as a standard feature. Previously, the technology was only available on full-sized excavators and wheel loaders. HiMATE uses GPS to monitor key machine components such as the engine, hydraulics and electrical system, while giving contractors a variety of time- and money-saving benefits, Rogers said. One of the key features of the technology is that it promotes greater preventive maintenance to reduce equipment downtime. JCB's Ashby Graham noted that the selection of any excavator, no matter the size, depends on how a contractor plans to use it. "You have to think about how much weight and capacity you need," she explained. "Are you working in small, tight and confined areas where you only need a mini that can be put onto the back of a trailer for transport from job site to job site? Or are you doing more advanced work and need mid-size or large excavators that can dig and lift a heavy load? 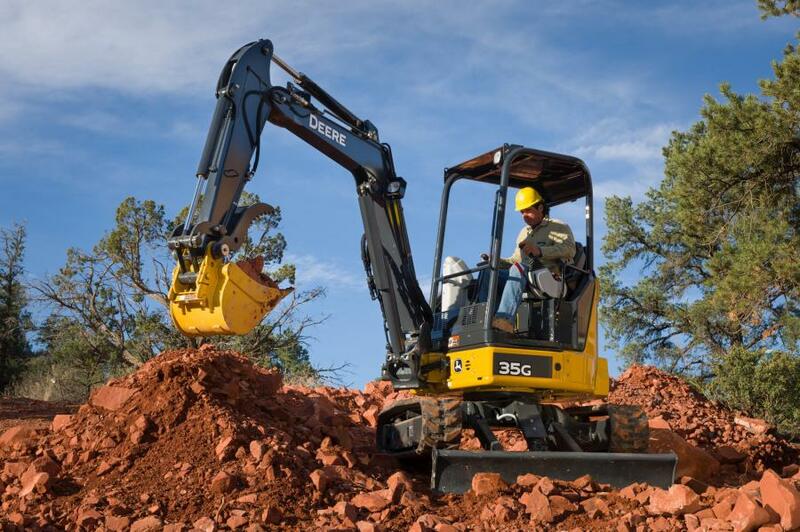 Typically, excavator customers make their determinations by looking at the weight class." JCB's 45Z-1, 48Z, 55Z, 85Z and 90Z zero tail-swing compact excavators, which work within the width of their tracks, address the need for smaller machines that are quick, powerful and productive. 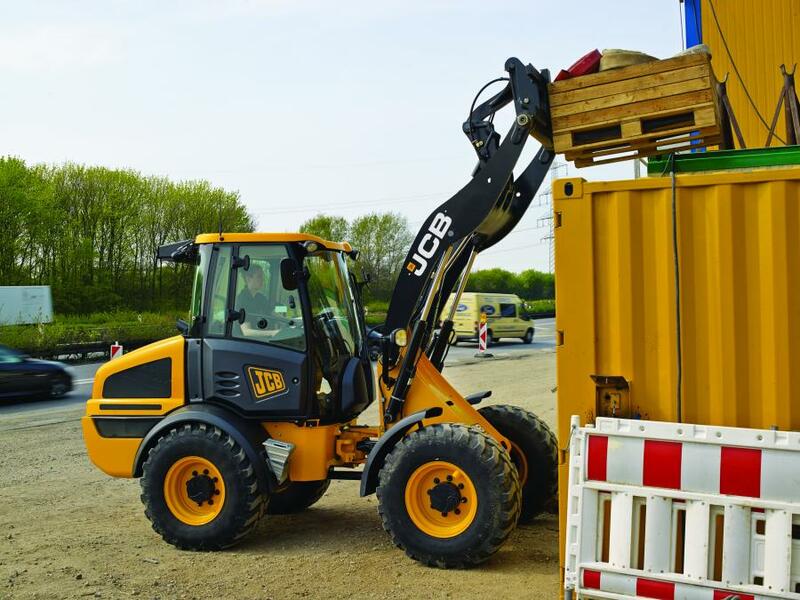 One of JCB's most popular models is the 45Z-1, launched in early 2017. It has an operating weight of 9,879 lbs. and a transport weight of 9,605 lbs., making it one of the largest and most powerful compact excavators that can be towed behind a pick-up truck. "On our skid steers, for example, we have what we call a ‘high-vis boom,' a low-slung boom arm that gives you plenty of visibility on that right-hand side. We don't have a boom on the left, so we have an unobstructed view on that side. We also don't have a traditional mesh over glass that comes standard on many of our competitors' models, so the visibility on the JCBs really aid you in doing your job." Compared with some compact equipment, wheel loaders have better visibility, a large cab space, and better durability when it comes to tire wear and traction, especially on more sensitive surfaces. They also have a greater lift capacity than other compact loaders. Cat has heard from its compact wheel loader customers that they want more capacity from the machines' same footprint to keep maneuverability at an optimum level, said Scott Britton, production application specialist of the nine different models Cat produces. "For example, on our 903D, we've increased our lifting capacity by 25 percent while still maintaining our overall weight for trailering," he noted. "Furthermore, we've updated our ground speed, another demand of our customers, by 25 percent to get work done that much faster. Fuel efficiency is a key metric that owner/operators also pay attention to. As machine technology has progressed, so has our overall fuel efficiency with new Tier IV-compliant fuel systems." In addition, Britton said, Cat products are built with the lowest cost of ownership in mind, no matter their size. Higher production, with lower fuel burn, even on smaller equipment, is the equation to that low ownership cost. "Cat offers ‘behind-the-scenes' technology on compact wheel loaders so that low fuel burn and easier operation is as efficient as possible without operator interface," he continued. "Features like adjustable, integrated auxiliary hydraulic controls, ride control and creeper ground-speed controls that eliminate operators from having to ride the brake or hold down the throttle pedal, engage the way they should without the operator having to work harder to get the job done." Two of the five compact wheel loaders produced by John Deere also were designed based on customer requests, reported Drew Miller, the manufacturer's marketing manager of the product line. "The 204L and 304L models offer an optional cab but come standard with a purpose-built two-post ROPS and a switch-and-monitor layout specifically designed for each," Miller explained. "The two-post ROPS provides wide open visibility to the front of the machine by removing the forward posts and makes getting in and out of the machine a cakewalk. We also designed them to be able to get into low overhead entries so if you need to get in and out of a shipping container or a low barn door, our machines can help you there, too." John Deere's 244L, 324L and 344L compact loaders are part of its Articulation Plus lineup that offer an industry-exclusive steering system, said Miller. Instead of articulating the traditional 40 degrees, they instead articulate 30 degrees and add another 10 degrees of rear-wheel steer. "This provides three benefits to the customer: ability, agility, and stability," he noted. "Ability is giving the machine excellent full-turn tip load or lift capacity. By articulating less, we keep the weight of the machine farther from the load, helping operators lift more. A tight turning radius through the articulation and added rear-wheel steering gives the loaders the agility needed to maneuver better. Stability is accomplished by keeping our tip load capacities closer together so as the operator loads the bucket from the pile, then backs up and starts articulating, he will have the confidence to know the machine will manage the material." Full-size performance with compact efficiency best describes the Kubota line of compact wheel loaders, said Jacobsmeyer. He pointed to its deluxe instrumentation, modern controls and an optional cab with A/C that makes the Kubota R Series loaders a great choice for customers. 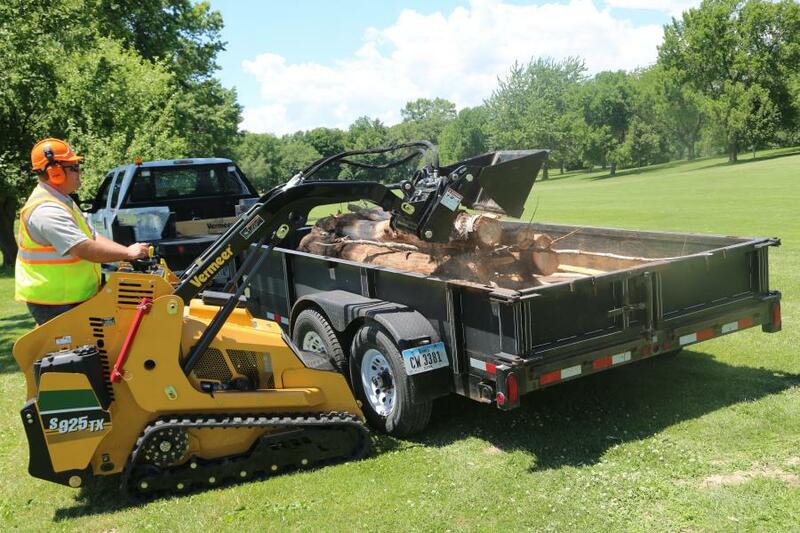 "Both R Series models, the R530 and the R630, offer an optional skid steer-style coupler that allows the use of many common front attachments that customers already own and may have for skid loader operations," he reported. 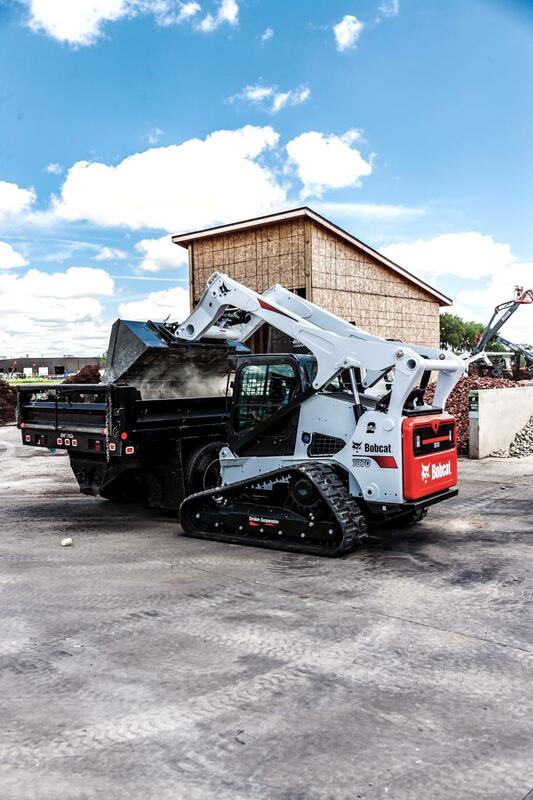 Both models are compact workhorses and with their distinctive red and black color scheme are easy to spot on construction projects. The R530 has a rated operational capacity of more than 2,700 lbs. with a bucket; the R630's lifting capacity is 3,500 lbs. "All Kubota construction equipment is built with the same philosophy in mind: do more work in less time. With a focus on performance and practicality, our construction products will handle the toughest jobs with unrivaled ease-of-use," Jacobsmeyer said with assurance. Each piece of compact and mini equipment is meticulously built after a manufacturer invests a lot of time and effort into listening to the concerns of its customers. By discovering their specific wants and needs, OEMs design and build machines that ensure onsite production remains high and costs are kept low for end-users. "Anytime you can put more money back into a customer's pocket, he is going to come back to you," said JCB's Ashby Graham. "So, if you are not listening to your customers, you are not going to have them for very long."